Optical non linearities with Rydberg atoms in an optical high finesse cavity. My task at the Surface Quantum optics group in Tubingen is to investigate the optical nonlinear behaviour arising from interaction between light fields in optical cavities and atoms with long-range interactions. To achieve this, we plan to employ a cloud of highly excited atoms, i.e. Rydberg atoms trapped inside a high finesse optical cavity. The findings are very beneficial to generate non-classical states of light and realize efficient quantum memories which are key components in quantum networks and quantum information processing. Our research focuses on reaching the quantum nonlinear regime in interacting light atom systems. Using Rydberg states of the atoms enables us to preserve the nonlinearity in our system via Rydberg blockade. The high finesse cavity extends our system to the quantum nonlinear regime. Thus, in developing the experimental setup, we will start with the preparation of the Rydberg atomic cloud in a high finesse optical cavity. The first goal is to observe strong coupling of light and Rydberg states in the optical cavity. Next we plan to investigate the Rydberg blockade followed by generation of non-classical states of light with Rydberg atoms. In order to develop the experiment I’m involved, I will use the rich knowledge and the expertise on both theory and experiments in cold Rydberg atoms available within the ColOpt network. This is planned both by attending the network meetings, and by research visits to industrial partner Toptica photonics in Munich (Germany), and research stays at University of Wisconsin in Madison (USA) on experiments with Rydberg atoms and University of Saarland (Germany) on atom-cavity theory. Moreover, we will collaborate with groups at University Tubingen as well. The novelty in our project is the optical high finesse cavity in which the cloud of Rydberg atoms are trapped in. So far, only two groups have studied Rydberg atoms in optical cavities (moderate and low finesse) which lacked enough cooperativity to reach the quantum regime. Our approach promises sufficient enough cooperativity to reach the quantum regime while preserving the non-linearity. This will enable us to realize and implement not only efficient quantum memories, but also to generate non-classical states of light and combine with superconducting atom chips for quantum computing applications. I was born in Lima, the capital of Peru, in 1990. 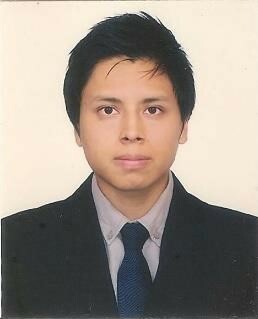 In 2013 I obtained my Bachelor’s degree in Physics from the Pontifical University Catholic of Peru (PUCP). The following year, I started a Masters in Physics at the same university under the supervision of Prof. Francisco De Zela. I graduated in 2016 with a thesis presenting experimental results on the geometric phase of maximally entangled polarization and momentum degrees of freedom of single photons. After my Masters I was employed at PUCP. On one hand, I continued my research on the same line as my Masters project but from a theoretical point of view; on the other hand, I took more responsibility at the quantum optics lab at PUCP by teaching younger students. I started an internship at the Physics Institute of the University of Tübingen in January 2018. I joined Prof. Zimmermann’s group; in particular, the CARL lab, so as to develop a heterodyne detector that is to be used to characterize very dim light (pW level) at one output of a ring resonator. In June of the same year I started my PhD studies at the University of Tübingen under the supervision of Prof. Slama in the context of the ColOpt network.